Posted on April 19, 2017, by Tim Stoneham in Tea News Tea Recipes . We love Matcha! This traditional Japanese powdered green tea used to be used exclusively for tea ceremonies. Over the last few years Matcha has become very fashionable in the UK/US. Hailed for its healthy properties it’s being used in all sorts of ways! Now we can find Matcha in cakes, chocolate, ice-cream, as an additional ingredient in smoothies or sprinkled over breakfast cereal. Cafes have even adopted it as part of their repertoire offering Matte Lattes! 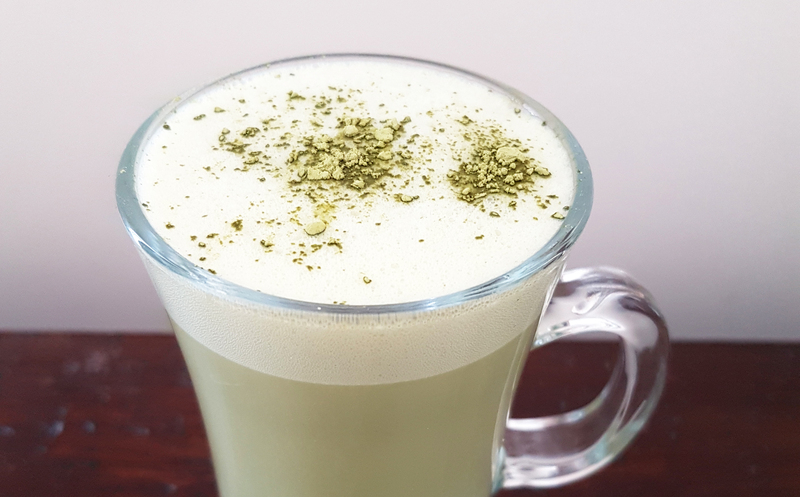 We wanted to find the best way to make a Matcha Latte from the comfort of your own home. What would taste best? What milk should we use? In Japan lattes are often made using soya milk. The options we chose are: Soya Milk, Almond Milk, Whole Cows Milk and for something a bit different a Dark Chocolate Almond Milk. What you’ll need: We’re using our Matcha Izu cooking grade Matcha powder. Use 1tsp of Matcha Powder and add 3tbsp of warm water (no warmer than 50C) and stir. Warm your milk of choice. It should be no more then 50-60C otherwise it will start to curdle. 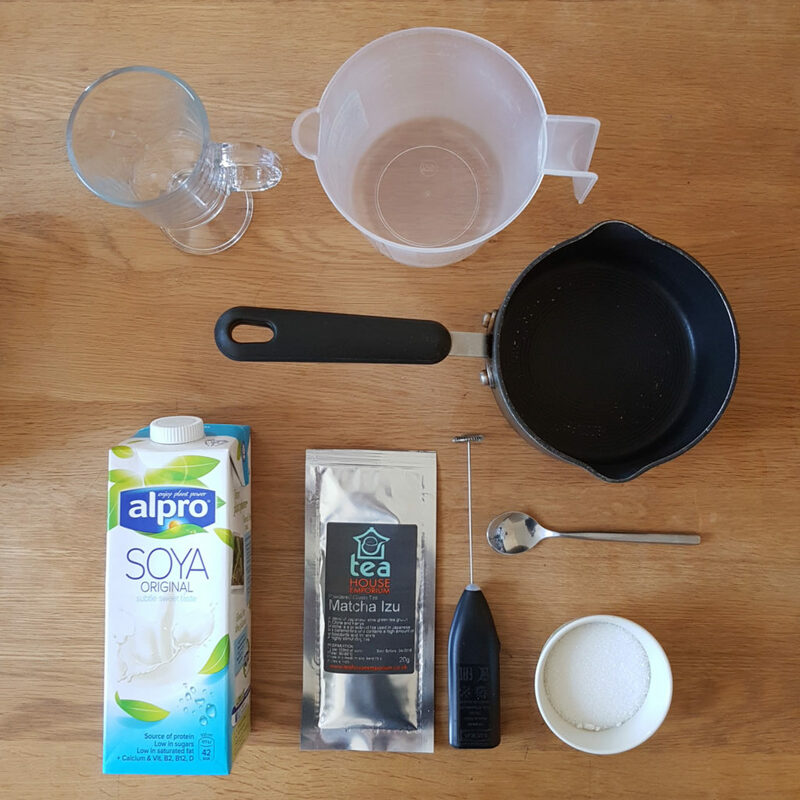 We recommend stirring the milk whilst it’s heating so it doesn’t stick to the pan (this advice is more for Soya Milk which seems very prone to doing this!). Once the milk is heated to the correct temperature add your Matcha and whisk. We used an electric hand whisk from Ikea. You can whisk by hand, but it will take a bit longer and your beverage could go cold! Pour into your mug/glass. Add a little sugar to taste or sprinkle a little Matcha powder on top for decoration. Result: There is a slightly savoury, toasty flavour to the latte. The soya milk froths well and we found that it wasn’t necessary to add sugar. In Japan Soya milk is often used instead of cows milk and we can confirm that this tastes the closest to what we tried when travelling around Japan. Result: Very tasty! The almond milk give the latte a natural sweetness meaning that no extra sugar is necessary. There’s a very pleasant texture to the latte and the milk froths well. Of all the milks we tried, we felt this gave the best colour making it a more vibrant green. Result: Not successful. Surprisingly, this milk was the worst for frothing and had the worst texture. There was a very sour, bitter flavour to the latte and it left a funny taste in the mouth. Adding sugar did help. We’ve noticed a few places selling Matcha powder with added chocolate for very high prices! So we thought ‘How about we make our own?’ There are many ways you could add chocolate to your Matcha, or even you could add Matcha to your hot chocolate! In this instance we decided to try some dark chocolate almond milk as it was the most successful milk in our first trial. Result: Absolutely delicious! There is a wonderful balance between the naturally sweetish flavour of the almond milk with the dark chocolate flavour and that distinctive Matcha flavour.